After the emotional turmoil that was ‘Jesse’ subsides, Charlie manages to find peace with her decision to leave him, despite her conscience telling her otherwise. Saying goodbye to the drama proves to be an easier task than she anticipated. And although Charlie’s life continues to test her strength, her will, and her motivation to pick herself up and dust herself off, she carves a new path. Making positive changes in her life, she gets a new job, a new apartment, and a new guy; everything is nearly perfect. Nearly. He needs to find his Charlie. 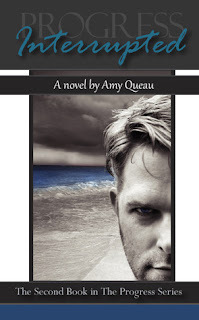 I was excited when Amy contacted me to review Interrupted. I needed to know what happened between Jesse and Charlie. Luckily, Interrupted picks up right where Progress left off. While Progress was good, this one is even better. I devoured this book. By the time I got to end, I had felt a hundred different things. And of course, I was left with the question I've had since the beginning... What is going to happen with Jesse and Charlie?! Even though the ending is a giant cliffhanger, the book is such a satisfying read. One of the reasons I enjoy this series so much is the fact that it's so relatable. I can connect to Charlie in so many ways. She's real and I understand and feel for her. I've known (and dated) a Jesse or two in my past. It's scary in some ways how much I can relate to the series. I've definitely become emotionally invested in the series and I cannot wait to see how it ends. I enjoy reading your reviews. They are straight from your heart! :) I'll definitely check out this series.